Upgrade the appearance of your interior with luxury vinyl flooring (LVF). At our flooring showroom, we display and sell stylish vinyl flooring in Billings, MT, that elevates the value and visual appeal of your property. Whether you are planning to revitalize your favorite rooms or remodeling your entire building, our company works with you so you attain the results you want at discount rates you can afford. Our customizable luxury vinyl tile and luxury vinyl plank selections offer versatility, appeal, and affordable wholesale pricing. We also offer a stunning selection of vinyl sheet flooring. Upgrade your property’s aesthetic appeal while protecting it from the wear and tear of everyday life. LVF is widely revered for its simplicity, style, and durability. Manufactured from composite materials, luxury vinyl incorporates layers of protective components to create a strong surface. The core provides a distinct feel and texture underfoot, while the supporting layers resist water, mold, and staining with ease. The top is reinforced with an enhanced “wear layer” that withstands daily foot traffic, as well as scuffs, scrapes, and impacts. Spend less time cleaning and more time enjoying the scenery. Luxury vinyl flooring resists dirt and liquid to create an easy-cleaning surface. As a result, busy households with children and pets are easier to keep tidy. The vinyl floors we sell are also graded for commercial use, which provides the opportunity to give your office a bold, new look. Enjoy the way your property stands out each and every day. Our LVF collections include versatile materials that enhance the interior decorating experience. State-of-the-art manufacturing methods enable this flooring to take on the appearance of “premium” flooring materials, such as hardwood, tile, and marble. This offers economic flexibility when planning your design efforts. Our well-trained sales representatives can direct you to the right options that accommodate your design capabilities, so you can design better and shop smarter. 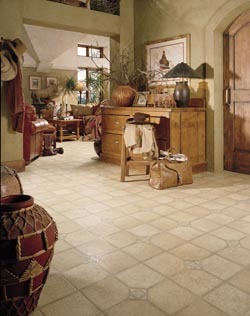 When it comes to vinyl tile flooring, it is vital that you choose to go with our professional installer. The best flooring in the world won’t look good if the installation isn’t performed right, but an expert craftsman is able to elevate any flooring to a higher level based on years of experience. You want to make sure that your flooring is cut to fit snug against your wall, without leaving noticeable gaps. The great thing about professional vinyl flooring installation is how quick they are. In the hands of an expert, vinyl takes very little time to install. Best of all, there is no breaking in period. Unlike some flooring choices, with vinyl, you can start walking on your new floors right away. With no breaking in period, you are able to get back to your life sooner and enjoy your home from the very beginning. Have a professional installer take a look at your home today and determine exactly how much flooring you need to get the job done. All kinds of vinyl tile flooring are waterproof, but they require a professional installation to make sure that your subfloor is properly protected. The thing about vinyl is that while it is completely waterproof, the gaps between the pieces are not. As long as you hire a professional to do the job this isn’t an issue though, and truthfully it only becomes an issue in cases where large amounts of water are allowed to collect on the surface. However, for customers who want all of the benefits of vinyl without the gaps, there is another way. Vinyl sheet flooring is the same outstanding flooring you are interested in, but it is rolled out from a large sheet and cut to size. For smaller rooms like bathrooms, the sheet is often able to go from wall to wall without the need for extra sheets. This allows you to have a perfectly waterproof surface without having to worry about any gaps that form between tiles, making it the perfect choice for bathrooms and kitchens. Looking for an economical way to give your home or office a distinct atmosphere? Replacing your flooring with a luxury vinyl plank is a smart choice. Our flooring showroom features a wide selection of vinyl plank flooring that emulates the appearance of hardwood flooring – right down to the unique grain patterns. Our showroom carries many different styles from popular wood species, including mahogany, rosewood, and pine. Elevate your flooring project with COREtec™ luxury vinyl flooring. The COREtec line is well known for its waterproof composition and mold-resistant base. These elements work together to create a tough floor that remains beautiful through everyday use. The innovative locking system also facilitates an even installation, giving your interior a smooth and uniform appearance from corner to corner. You put in the time and effort to choose your favorite flooring. Finish the project with installers you can trust. Our company can help organize and carry out total luxury vinyl flooring installation services that ensure your investment lasts. Our installation team has the equipment, experience, and expertise to complete your project according to your schedule and budget. Whether you are flooring a bare area or a place with existing materials, we adapt to your project area to deliver long-lasting results. Contact us today to place your order for new luxury vinyl flooring. We proudly serve clients throughout Billings, as well as Eastern Montana, and Northern Wyoming.